Do you live or work in the San Diego area and have a passion for small farms? We need your connections and expertise to help plan the 28th California Small Farm Conference! The conference will be March 7 - 10, 2015 at the Marriott Mission Valley in San Diego County. Attracting approximately 500 participants yearly, the California Small Farm Conference is the state's premier gathering of small-scale farmers, farmers' market managers, university researchers, federal and state agriculture agencies, agriculture students, food policy advocates, consumers and others. Attendees of the local planning meeting hear from CSFC President, Karen Rich Firestein. Each year we recruit local farmers, farming organizations, farmers' market managers and others to help us plan the Conference and focus on important local issues. 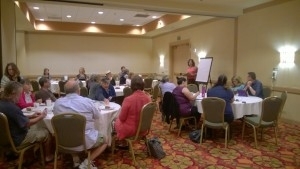 The important work of the Local Planning Committee volunteers ensures the success of the California Small Farm Conference. We are looking for dedicated individuals with a passion for agriculture, who work or live in the San Diego area, to join our 2015 Local Planning Committee! There are still openings for several volunteers to participate in planning by taking leadership roles on conference committees. These "super volunteers" will receive complementary registration and meals at the conference. We need your input on local contacts for speakers, workshop topics, field tours and the tasting event! The second meeting of the Local Planning Committee will be held on Monday, September 15 at the San Diego Marriott Mission Valley from 12:30 – 2:30 p.m.
Click here to RSVP to the September 15 Local Planning Meeting.